Judges and 'sizers were not free. At ten condemned, at two to die. To stop their speech caused beat the drum. And chas'd them up to Heav'n. 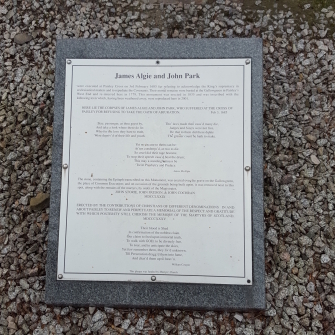 James Algie and John Park were the tenants of a farm at Kennishead, in Eastwood parish, Renfrewshire. It is claimed that Algie supported episcopacy until a few months before his death. They were asked to take the 'Test Oath' but had refused, so were taken to the tolbooth in Paisley where they were imprisoned. They were willing to take the Oath of Abjuration, but not the Test Act. The commissioner, the Laird of Orbiston, told them that if they did not take the Test, then they would hang. The two still refused. They were sentenced at 10 o'clock in the morning and were hanged at Paisley Green at 2 o'clock in the afternoon. The soldiers beat their drums until they were dead, to drown out their dying testimonies. 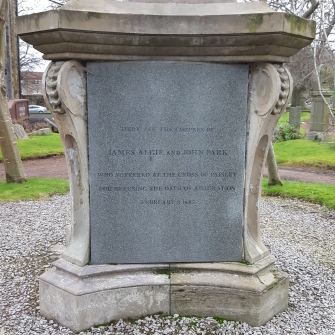 Algie and Park were executed at the Cross of Paisley on 3 February 1685. They were buried at the Gallow Green, near the foot of Maxwellton Street. 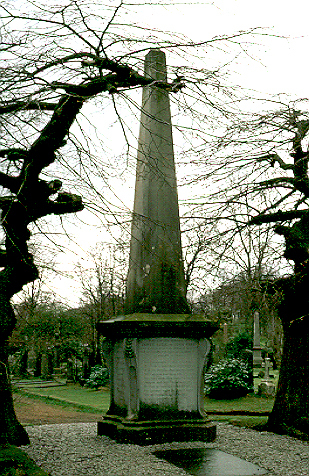 When development work was taking place in the area in 1779 their remains were disinterred and reburied at what was known as the Broomlands Burying Ground, where this monument was erected.